If you know your heart, it’s easier to understand heart valve disease. The heart’s four valves – mitral, tricuspid, pulmonary and aortic -- have tissue flaps that open and close every time the heart beats. The flaps control the movement of blood through the heart’s four chambers and into the body. The aortic valve separates the left ventricle, the heart’s main pumping chamber, from the aorta, the body’s main artery. When it closes, it holds oxygenated blood in the heart’s lower left chamber. When it opens, blood flows from the heart – via the aorta, from the left ventricle – into the body. A diseased aortic valve doesn’t work properly. If the aortic valve’s flaps don’t open or close as they should, blood being pumped into the aorta could leak back into the left ventricle every time the heart beats. Aortic regurgitation, as it’s called, can cause heart palpitations and fainting. If the valve stiffens and narrows from calcium buildup, a phenomenon known as aortic stenosis, it can lead to heart failure. For older people, aortic valve disease is the most common valvular condition. It’s possible to remain symptom-free for many years as your aortic valve disorder progresses. When symptoms finally appear – whether chest pain, shortness of breath or dizziness – they also could be indicators of other conditions. An exam by your doctor and requisite testing will provide a better idea of what’s causing your discomfort. 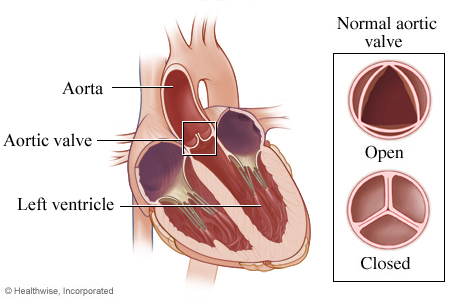 Aortic valve disease can be caused by aging, an infection (endocarditis), rheumatic heart disease or a congenital (present at birth) condition. The origin also could remain unknown. When the valve’s tree triangular flaps don’t close securely, blood leaks backward into the heart. This forces the heart to work harder. If it can’t pump sufficient blood to the body, you might experience heart failure. People with a congenital defect can have an aortic valve with either one or two flaps instead of the customary three. This can cause regurgitation but it could take many years. People with aortic regurgitation generally don’t report symptoms until middle age. When the valve’s three triangular flaps can’t open fully because they have thickened or stiffened because of an accumulation of calcium, preventing normal blood flow through the valve. This type of aortic valve disease typically appears in older adults. An estimated 2.5 million people over 75, more than 12 percent of that demographic, have aortic stenosis. Your doctor usually can spot aortic valve disease by detecting a heart murmur through a stethoscope during a physical examination. Echocardiogram: An ultrasound test that relies on a transducer that sends high-pitched sound waves to create moving pictures of your heart. Electrocardiogram: Records the spikes and dips of your heart’s electrical activity, typically with a device connected to a laptop that stores the results. CT Scan: A cardiac computerized tomography scan, using multiple X-rays, gets precise images of your aortic valves. Cardiac MRI: Magnetic Resonance Imaging provides detailed images of your heart through a powerful magnetic field and radio waves. Exercise stress test: A baseline test, on a treadmill, that makes your heart work increasingly harder. When the body demands more oxygen, requiring the heart to pump more blood, you doctor will see if the arteries that supply the heart get enough blood. Your heart’s activity is measured with an electrocardiogram. If abnormalities are found, a stress echocardiogram test might be ordered if your doctor suspects coronary artery disease. A stress echo, as it's called, uses ultrasound to get detailed information about the heart's four chambers. Chest X-ray: A basic chest X-ray helps your doctor determine if your pacemaker, defibrillator or other heart device is positioned properly. Coronary Angiogram (Cardiac Catheterization): A technology that uses dye and special X-rays to reveal the interior of your coronary arteries. This test requires cardiac catheterization, with small tubes inserted in a vein or artery (in the leg, arm or neck) that reach the heart so you doctor can use blood samples and blood pressures to evaluate the organ. Because an angiogram uses more powerful X-rays than a conventional chest X-ray, doctors will perform only when it’s considered essential. Medication can’t resolve aortic valve disease, only minimize its effects. Your doctor, for instance, might prescribe medications to control your blood pressure. Beta blockers and calcium blockers can reduce angina, or chest pain. Statin drugs lower blood cholesterol levels. For those with aortic stenosis, drugs can control an irregular heartbeat. When surgery is required, your doctor must decide whether to repair or replace your heart valve. Among the considerations: the seriousness of your heart disease, your age and general health and whether your heart requires additional treatment such as bypass surgery. The first choice, whenever possible, is repair over replace. Balloon dilatation: This conventional procedure, also known as balloon valvuloplasty or balloon valvotomy, widens the stenotic valve with a balloon inserted into a blood vessel using a catheter. The balloon, placed into the narrowed valve, stretches the valve as it expands. TAVR: For an increasing number of people with severe aortic stenosis, a newer procedure called transcatheter aortic valve replacement, or TAVR, has become an alternative to open-heart “sternotomy” surgery. In the TAVR procedure, a collapsible replacement valve inserted through a catheter takes the aortic valve’s place even though surgeons do not remove the original. As the replacement expands, it displaces the original valve’s leaflets and eventually assumes its role in regulating blood flow. This procedure starts with an incision in the groin or chest. In open-heart surgery, the surgeon must cut open the chest, spreading the ribs and muscles, to access the aortic valve before applying an artificial aortic valve.